This is an attractive 1888 Rand McNally and Company map of Vermont, United States. 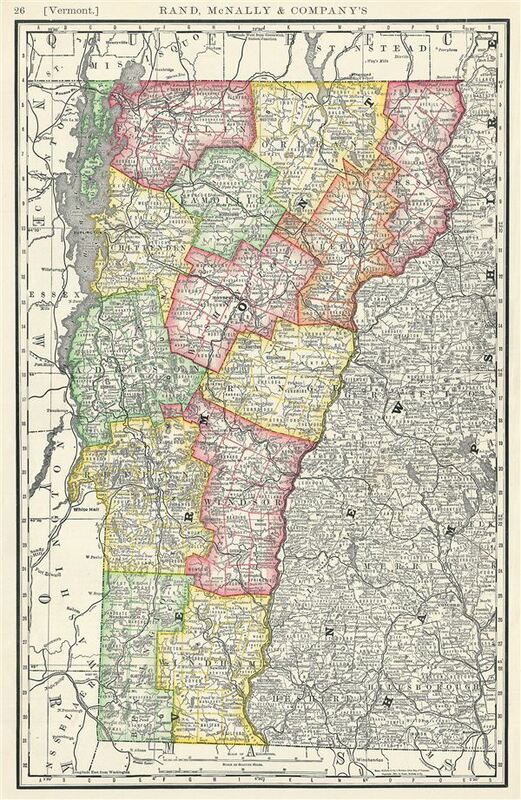 Centered on the Connecticut River, which forms the border between Vermont and New Hampshire, this map covers the state of Vermont and part of neighboring New Hampshire in extensive detail. Killington Peak, a popular ski resorts in Vermont is identified. Color coded according to counties, the map notes several towns, cities, railroads, and various other topographical details with relief shown by hachure. This map was issued as plate no. 26 in the 1893 issue of Rand McNally and Company's Indexed Atlas of the World- possibly the finest atlas Rand McNally ever issued. Rumsey 2094.018 (1889 edition). Philips (atlases) 952.